I'm not actually sad. I promise. I'm just wearing all blue so I have that horrible song in my head (da ba dee, da ba die). I know what you're probably thinking - that I wear these blue pants way too often. It's true. I wear them a lot. Truthfully, I only have a couple of pairs of dress pants that I like and these are one of them, so they get a lot of wear - especially when it's still a little too cold to wear skirts. BUT, the weather is getting so nice you guys. We're talking 70s. I don't want to make anyone stuck in the snow feel badly, but I am just so happy. I guess I'm the opposite of blue, really. It's so weird that blue is a color associated with sadness. I think of Lake Michigan and blue skies and that screams lovely weather and summer to me. 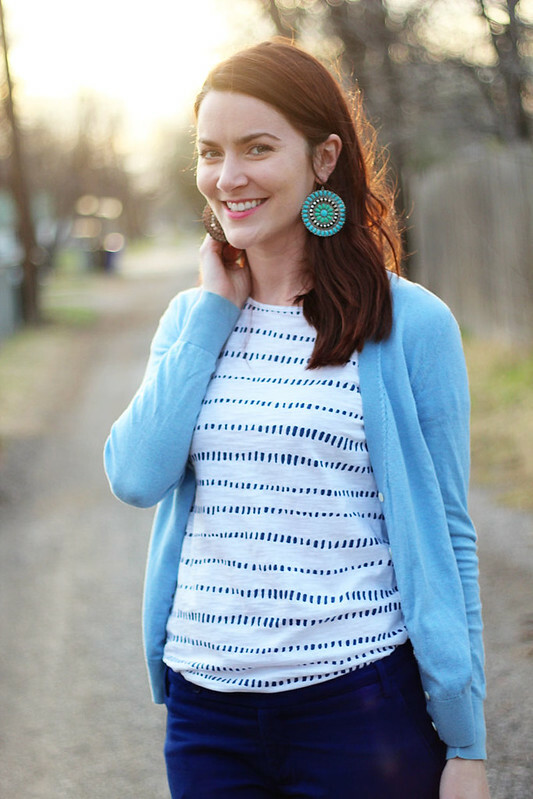 The blue on blue is adorable and I love that fun print tee! I'm wearing my blue ankle pants today too! Love this outfit, so many great shades of blue. And how appropriate, because today is the day to wear blue for Autism Awareness! I give you permission to wear these blue pants as much as you want. You know, since I have that power. :-) We are still in the torturous spring tease season. 70 degrees at noon on Monday turned into 30 degrees by about 4pm. And they are saying we will get snow on Friday. Noooooo!!! I'm so over winter, it's not even funny anymore. Look at you so trendy in your "statement earrings"! ;) I love the whole look! Who cares if you wear these pants often? They look great on you, and I love this outfit for so many reasons. One, I love the design on the tee; it's a little different. Two, those earrings! They're gorgeous. Three, I am in love with those shoes. They're the perfect color to go with everything. Four, those pants are awesome enough to wear at least once a week. I absolutely adore this shade of blue on you! It's so flattering - especially with those earrings! Thanks for getting that song stuck in my head too, I might actually have to listen to it. I can't blame you for wearing these pants so often (if that's even true). If I had blue pants, I'd wear them just as often. I love to hear that you are happy-- I hope it stays that way! I absolutely love your earrings! Ash, even though are adorned in blue, you look far from it. You look happy and fresh and vibrant! And those earrings are the perfect statement accessory! Well I'm glad to hear you're not actually feeling blue! I can't blame you for wanting to wear those pants so much. They are quite classy and look SO amazing on you. 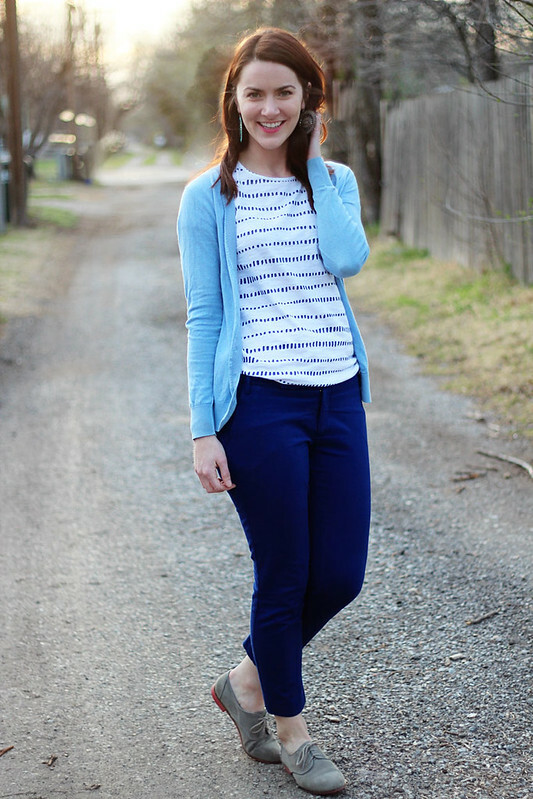 Rock those navy pants girl! You definitely look ready for warmer weather in those stunning earrings! Can't wait for it to hit 70 here... probably not for another month! You are Beautiful in all your Blue Goodness, Ashley. You always rock earrings in that style, too. I am doing a 30 for 30 Remix Challenge this April and I included quite a few Blue Pieces. Actually the next Outfits I will be posting will be with lots of Blue. Love the shades of blue and beautiful statement earrings! Ahaha oh man now I'm singing that song - thanks for that! And side note, one of my friends thought the words were "I'm blue I'm in need of a guy… I'm in need of a guyyyy…"
I love this outfit though! Those oxfords are adorable! I love my heels but I just have a love for oxfords lately! AHH I haven't heard (or thought of) that song in basically forever!! Loving the monochrome outfit. 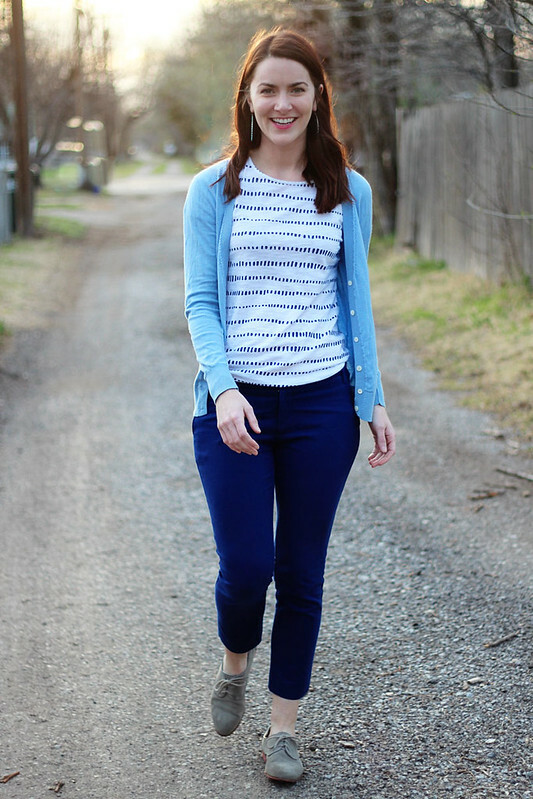 I really love combining different shades of blue this spring as well. Those earrings are fabulous! Great outfit all around! 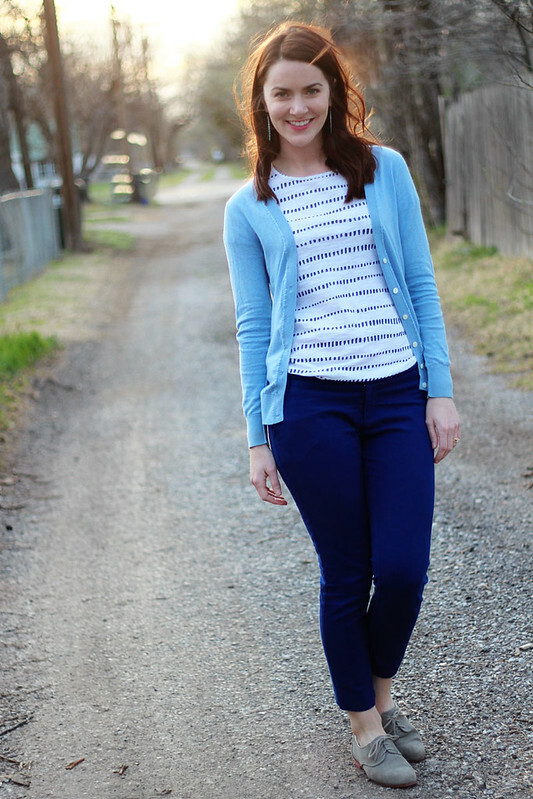 I love the different shades of blue in this outfit, and your oxfords are perfect. Such a cute look! Yessss, those blue pants are fantastic! I love your shirt, too - it's a simple basic, but it's interesting (I've not seen a print like that before, so cool!). Annnnd I totally have that song in my head right now.